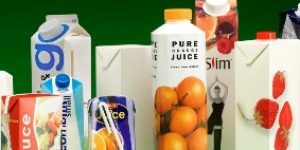 Many retailers and manufacturers are working hard to reduce their packaging. My concern is whether some of them are doing the best they can. In a recent story, Marks and Spencer have announced they will be saving 525 tonnes of packaging a year on their mini wine bottles. Sounds great on the surface of things, until you realise they are switching from glass to polyethylene terephthalate (PET). This is something that happens a lot in industry; Kenco switched from glass jars to plastic refills (which I quizzed them about) and partnered with Terracycle to upcycle these plastic packs into goods. I understand we need to look at the bigger picture; not just landfill waste. Producing plastic bottles, according to Marks and Spencer, are 88 per cent lighter than glass bottles, and use less energy in their manufacture. Obviously the lightweight bottle means lorries use less fuel to deliver the wine too. Until we return to the deposit system, glass is ecologically a very expensive form of packaging – the “recycling” is inefficient and incomplete, new products are rarely made from it, etc. New plastics are made from old plastics slightly more often than new glass from old glass. Post-consumer recycled paper is also fairly uncommon, mind you. first we had the water bottles, then the soda bottles, again the baby bottles and the last straw, the bent straws at the final nursing home! from cradle to grave we are covered in plastic, now they want to serve my liquid of the gods in –horror–plastic?, what would grand-mama think? yes, we have thought of that, previously–indeed pthalates have been on the mind of many, and if they purchase their beverages in light -and-convenient form..they are buying much more than they bargained for. it must be the french in me which balks at the very mention of -wine-in-plastic. i do savor cheap and delicious vintage vintages, but whoa! that peculiar after taste of plastique must be an insult to wellness. solution? return and refill systems for any licensed vendor of beverages…the homeless need the extra discretionary income, so does the thrifty house-person. However, if more of us do this sort of thing, the message will filter through eventually. @Ailbhe: Thanks for your thoughts; I think many of us would like to see a return to the deposits system; it seems to make so much sense. @nadine Sellers: Well that doesn’t surprise me about the cancers being linked to our toxic environment. I don’t even drink wine, but the thought of it in plastic is so weird! Return and refill sounds perfect. I’ve seen a place in Italy where they do exactly that- everything from olives to wine in your own bottles and containers. I would also love to see a return to the old deposit system for bottles, as well as a return to the very old fashioned ” jug and bottle ” system of bringing all kinds of containers from home to be filled with many edible & household substances. It would require quite some adjustment & education, though, in these germ fearful times. I do also have to point out that much as I love older style ways, there were some drawbacks & dangers in containers of days of yore – lead glazed pottery, anyone ? Heh well – historically speaking, there has been adulteration of and tampering with goods for many centuries ! I remain convinced that there must be a happy medium possible, with a combination of re-educating into more ” old style ” ways of thinking, and using 21st century in a positive non ecological damaging way to ensure people’s health and safety. Or do we just accept that there is an element of risk in all things, even buying a piece of cheese …the solution is out there somewhere ! I don’t buy wine from Marks and Spencer’s and now I will make doubly sure I don’t. I can’t believe plastic is more environmentally friendly than glass in the long run and I don’t understand how M&S can transport more because plastic is lighter. The bottles will still take up the same volume. I presume the wine would not be bottled abroad nor flown here from afar, but shipped from the country of origin and then bottled in this country. That’s how it used to be done, and that is probably the best method from the point of view of the environment. Less use of corks are another issue. Cork trees are good for their local environment, and using real corks in wine bottles ensures they continue to be grown. While I very loudly applaud you educating everyone about recycling, reusing and buying less packaging; I also have to say this: The bottom line is to get everyone doing their part to keep waste down and think in a way that will benefit more people. How everyone decides to do this will vary greatly just as how we spend our hard earned wages. Some people use their money on designer labels, others go to Goodwill and still others choose “green” products which are more expensive in the end than just plain “new” products from Target or Walmart. I think we all need to develop our frugal side and realize that many of us ARE trying to do better but this is an individual expression in every sense. Great website by the way!! Wonderful you tube, John – thank you for sharing with us.. I very much doubt that the claims M &S are accurate. I work for a waste disposal company and we have been landfilling their waste throughout the whole of last year. Yet according to the M & S website they claim that they were recyling 92% of operational waste in November last year. Why do they issue plastic bags, when that most councils won’t recycle when they could sell paper bags that are better for recycling? @Peter Davis: Hello Peter, thanks for your comment. It’s interesting that you have first hand experience. As consumers we have to rely on media and the store themselves for information, but it’s great if we can get a different perspective. Let’s hope charging for carrier bags increases to encourage more people to use their own. @Mrs Green: From October this year there will be a minimum 5p levy on plastic bags in shops in Wales. This was going to be introduced in March and with a higher levy but the Environment Minister bowed to pressure from retailers.